Kim K. and Antonin! Congrats, Kim K. and Antonin, and thanks for entering. Your awesome prizes will be on their way to your mailboxes shortly. Enjoy, and thanks again for checking us out at TV Screener.com! Just watched the Neil Patrick Harris episode of Glee from the show’s first season … NPH and Matthew Morrison dueting on Dream On … Kevin McHale, as Artie, fantasizing about a song-and-dance version of Safety Dance … great stuff! And with the Glee season two premiere just two weeks away (Sept. 21, 8PM ET, Fox), Fox Home Entertainment has given TVScreener.com two copies of the new Glee season one DVD box sets to give away to two lucky readers! 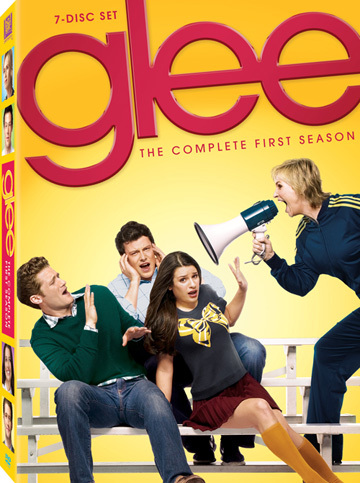 “Gleeks” and “Cheerios” worldwide will celebrate September 14 when the groundbreaking musical comedy GLEE: The Complete First Season, The GLEEK Edition debuts on Blu-ray and DVD from Twentieth Century Fox Home Entertainment. GLEE follows an optimistic teacher who – against all odds and a malicious cheerleading coach – inspires McKinley High’s Glee Club to conquer the world one singing competition at a time. GLEE stars Dianna Agron, Chris Colfer, Jessalyn Gilsig, Jane Lynch, Jayma Mays, Kevin McHale, Lea Michele, Cory Monteith, Matthew Morrison, Amber Riley, Mark Salling and Jenna Ushkowitz. The hit show has attracted celebrity guest appearances by Kristin Chenoweth, Eve, Josh Groban, Jonathan Groff, Neil Patrick Harris, Olivia Newton-John, Idina Menzel and Molly Shannon. GLEE: The Complete First Season, The GLEEK Edition Blu-ray and DVD are bursting with exclusive bonus materials and extended episodes, a sing-along karaoke, a behind-the-scenes look at The Power of Madonna episode, Glee Makeovers, never-before-seen “Sue’s Corners” and a dance tutorial titled “Staying in Step with Glee.” GLEE: The Complete First Season, The GLEEK Edition will be available in a four-disc Blu-ray and seven-disc DVD set. Figure out the theme song to your life through this fun and insightful question and answer application. Send your friends and loved ones to detention with the nefarious Sue. Once in detention, Sue begins to berate the friend, nonstop and without fail. Their picture will begin to deteriorate as Sue’s lecture goes on and eventually evaporate into dust. During the lecture, they will not be able to navigate away until the detention period has ended. They will be able to shoot spitwads at Sue, but beware, if they hit her in the head, it extends Detention! Which of the following singers has not been a guest star on Glee? Idina Menzel. Haven’t really watched Glee, but my roommate loves it. I mean, John Mayer. Read the question wrong. Our price is on the way to the mailbox but we dont have to tell our zip code ? John Mayer hasn’t been on the show. John Mayer , no doubt. John Mayer never played in Glee. John Mayer , without a doubt. I’M A GLEEK, AND I HOPE I WILL WIN. John Mayer & let’s hope he stays away. John Mayer!! I love GLEE!!! Please, i want it ! JOHN MAYER. JOHN MAYER. JOHN MAYER.